Home » Math basics » Statistics » Why divide the sample variance by N-1? Why divide the sample variance by N-1? Whereas the former is what you will typically need, an example of the latter would be the estimation of the spread of white Gaussian noise. Since the mean of white Gaussian noise is known to be zero, only the variance needs to be estimated in this case. Figure 1. Gaussian density function. 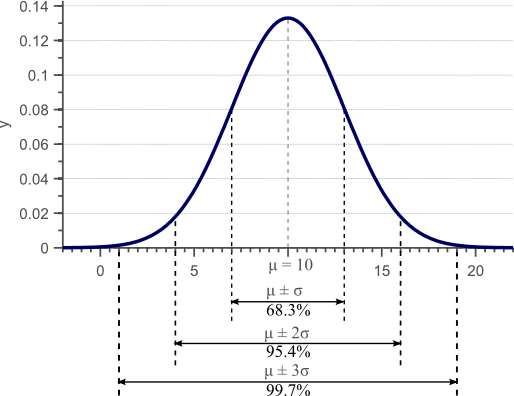 For normally distributed data, 68% of the samples fall within the interval defined by the mean plus and minus the standard deviation. Usually we assume that the empirical mean is close to the actually unknown mean of the distribution, and thus assume that the observed data is sampled from a Gaussian distribution with mean . In this example, the actual mean of the distribution is 10, so the empirical mean indeed is close to the actual mean. Again, we usually assume that this empirical variance is close to the real and unknown variance of underlying distribution. In this example, the real variance was 9, so indeed the empirical variance is close to the real variance. The only difference between equation (2) and (3) is that the former divides by N-1, whereas the latter divides by N. Both formulas are actually correct, but when to use which one depends on the situation. 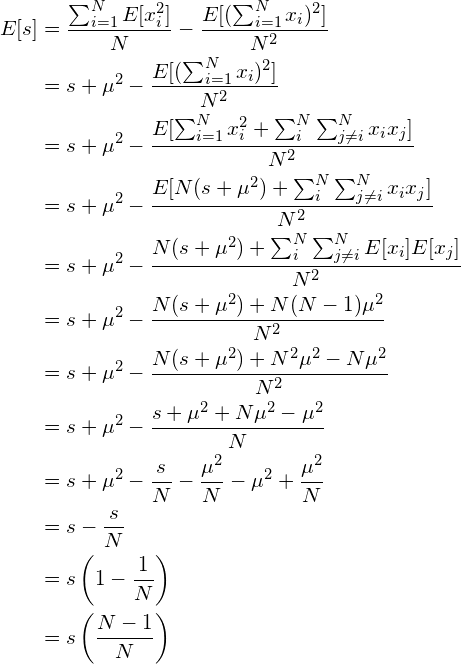 In the following sections, we will completely derive the formulas that best approximate the unknown variance and mean of a normal distribution, given a few samples from this distribution. We will show in which cases to divide the variance by N and in which cases to normalize by N-1. A formula that approximates a parameter (mean or variance) is called an estimator. In the following, we will denote the real and unknown parameters of the distribution by and . The estimators, e.g. the empirical average and empirical variance, are denoted as and . Equation (6) will be important in the next sections and will be used to derive the well known expressions for the estimators of the mean and the variance of a Gaussian distribution. To determine if an estimator is a ‘good’ estimator, we first need to define what a ‘good’ estimator really is. The goodness of an estimator depends on two measures, namely its bias and its variance (yes, we will talk about the variance of the mean-estimator and the variance of the variance-estimator). Both measures are briefly discussed in this section. If the above conditions hold, then the estimators are called ‘unbiased estimators’. If the conditions do not hold, the estimators are said to be ‘biased’, since on average they will either underestimate or overestimate the true value of the parameter. Unbiased estimators guarantee that on average they yield an estimate that equals the real parameter. However, this does not mean that each estimate is a good estimate. For instance, if the real mean is 10, an unbiased estimator could estimate the mean as 50 on one population subset and as -30 on another subset. The expected value of the estimate would then indeed be 10, which equals the real parameter, but the quality of the estimator clearly also depends on the spread of each estimate. An estimator that yields the estimates (10, 15, 5, 12, 8) for five different subsets of the population is unbiased just like an estimator that yields the estimates (50, -30, 100, -90, 10). However, all estimates from the first estimator are closer to the true value than those from the second estimator. A good estimator is therefore is a low bias, low variance estimator. The optimal estimator, if such estimator exists, is then the one that has no bias and a variance that is lower than any other possible estimator. Such an estimator is called the minimum variance, unbiased (MVU) estimator. In the next section, we will derive the analytical expressions for the mean and the variance estimators of a Gaussian distribution. We will show that the MVU estimator for the variance of a normal distribution requires us to divide the variance by under certain assumptions, and requires us to divide by N-1 if these assumptions do not hold. Although numerous techniques can be used to obtain an estimator of the parameters based on a subset of the population data, the simplest of all is probably the maximum likelihood approach. Figure 2. This plot shows the likelihood of observing fixed data if the data is normally distributed with a chosen, fixed , plotted against various values of a varying . 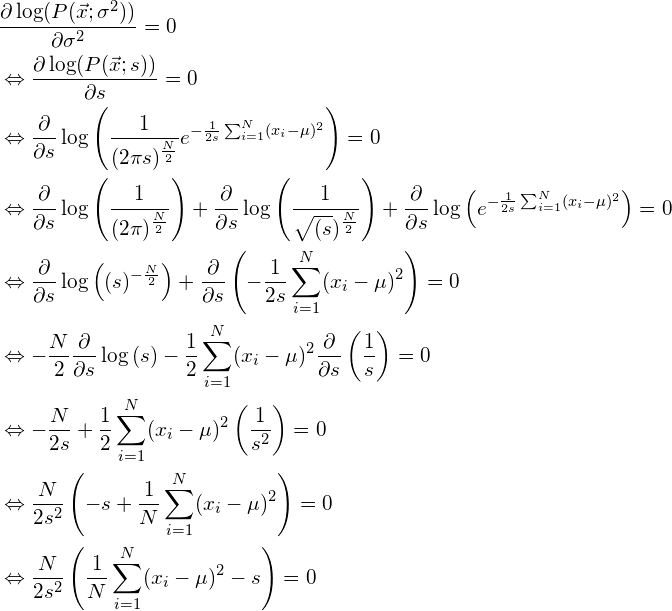 Therefore, the formula to compute the variance based on the sample data is simply derived by finding the peak of the maximum likelihood function. Furthermore, instead of fixing , we let both and vary at the same time. Finding both estimators then corresponds to finding the maximum in a two-dimensional likelihood function. The first case assumes that the true mean of the distribution is known. Therefore, we only need to estimate the variance and the problem then corresponds to finding the maximum in a one-dimensional likelihood function, parameterized by . Although this situation does not occur often in practice, it definitely has practical applications. For instance, if we know that a signal (e.g. the color value of a pixel in an image) should have a specific value, but the signal has been polluted by white noise (Gaussian noise with zero mean), then the mean of the distribution is known and we only need to estimate the variance. The second case deals with the situation where both the true mean and the true variance are unknown. This is the case you would encounter most and where you would obtain an estimate of the mean and the variance based on your sample data. In the next paragraphs we will show that each case results in a different MVU estimator. More specific, the first case requires the variance estimator to be normalized by to be MVU, whereas the second case requires division by to be MVU. Note that this maximum likelihood estimator for is indeed the traditional formula to calculate the variance of normal data. The normalization factor is . However, the maximum likelihood method does not guarantee to deliver an unbiased estimator. On the other hand, if the obtained estimator is unbiased, then the maximum likelihood method does guarantee that the estimator is also minimum variance and thus MVU. Therefore, we need to check if the estimator in equation (10) is unbiassed. Since , the condition shown by equation (7) holds, and therefore the obtained estimator for the variance of the data is unbiassed. Furthermore, because the maximum likelihood method guarantees that an unbiased estimator is also minimum variance (MVU), this means that no other estimator exists that can do better than the one obtained here. Therefore, we have to divide by instead of while calculating the variance of normally distributed data, if the true mean of the underlying distribution is known. In the previous section, the true mean of the distribution was known, such that we only had to find an estimator for the variance of the data. However, if the true mean is not known, then an estimator has to be found for the mean too. Furthermore, this mean estimate is used by the variance estimator. As a result, we will show that the earlier obtained estimator for the variance is no longer unbiassed. Furthermore, we will show that we can ‘unbias’ the estimator in this case by dividing by instead of by , which slightly increases the variance of the estimator. 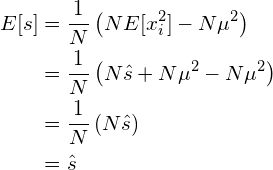 Note that indeed this is the well known formula to calculate the mean of a distribution. Although we all knew this formula, we now proved that it is the maximum likelihood estimator for the true and unknown mean of a normal distribution. For now, we will just assume that the estimator that we found earlier for the variance , defined by equation (10), is still the MVU variance estimator. In the next section however, we will show that this estimator is no longer unbiased now. Since , this means that the obtained estimator for the mean of the distribution is unbiassed. Since the maximum likelihood method guarantees to deliver the minimum variance estimator if the estimator is unbiassed, we proved that is the MVU estimator of the mean. Since clearly , this shows that estimator for the variance of the distribution is no longer unbiassed. In fact, this estimator on average underestimates the true variance with a factor . As the number of samples approaches infinity ( ), this bias converges to zero. For small sample sets however, the bias is signification and should be eliminated. This estimator is now unbiassed and indeed resembles the traditional formula to calculate the variance, where we divide by instead of . However, note that the resulting estimator is no longer the minimum variance estimator, but it is the estimator with the minimum variance amongst all unbiased estimators. If we divide by , then the estimator is biassed, and if we divide by , the estimator is not the minimum variance estimator. However, in general having a biased estimator is much worse than having a slightly higher variance estimator. Therefore, if the mean of the population is unknown, division by should be used instead of division by . In this article, we showed where the usual formulas for calculating the mean and the variance of normally distributed data come from. Furthermore, we have proven that the normalization factor in the variance estimator formula should be if the true mean of the population is known, and should be if the mean itself also has to be estimated. In this article, we explain why and when to divide by N or by N-1 while calculating the sample variance of normally distributed data. We derive the formulas to calculate the mean and variance of by maximum likelihood parameter estimation. «What are eigenvectors and eigenvalues? Hi Brian, tnx for your feedback. However, I’m not sure what you mean. The PDF actually does represent the probability of observing x. Obviously, since x is continuous, you need to integrate the PDF over a small interval surrounding x to obtain the actual probability. That was my only point, that calling  a probability (as in “The probability of observing a point x….”) is not technically correct – for that reason you mentioned. Thanks again, Brian. Talking about likelihood functions instead of probabilities is probably more accurate in this context indeed, so I changed it. I was looking for this proof for so long. Thanks for sharing. Thanks for the awesome work. I’ve enjoyed a number of your articles so far! I am writing to let you know about an awesome book called “Probability Theory: The Logic of Science” by ET Jaynes. Chapter 17 in that book has a great section on the pathologies of unbiased estimators in general. He goes on to show that the optimal estimator (in the minimum mean square error sense) is the first moment of the posterior distribution (which you may want to marginalise if you are only interested in one of the parameters). Long story short, there is a serious problem with using your unbiased estimator for the variance, especially for non-gaussian sampling distributions. 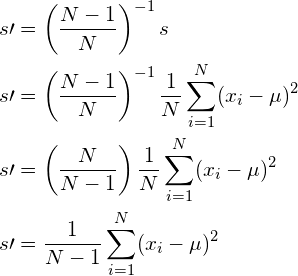 The variance of the estimator is worsened by using the N/(N-1) multiplicative correction to equation (3) in your article. That is to say that you can do better (in the mean square error sense) than equation (2) if you are considering the class of multiplicative corrections to estimate the variance from equation (3). Let me know if you’d like more details. Hi Jacques, thanks for your comment. I will defintely have a look at the book you mentioned! Although it is true that the variance of the estimator increases a bit by introducing Bessel’s correction, a slight increase in variance is often prefered over a biassed estimator. However, as you mention, it is indeed important to consider the Gaussian assumptions in the above derivations. For non-Gaussian distributions you might indeed want to considere different options, but then again the variance is usually not a very interesting statistic for non-Gaussian distributions. Thanks again for your valuable feedback! Thanks a lot for the wonderful post. Just one clarification : shouldn’t it be underestimates the true variance by a factor of n-1/n rather than overestimates ? Obviously you are right, Tushant. Thanks for your input! I just fixed this typo. Thanks very much. Beautiful post. 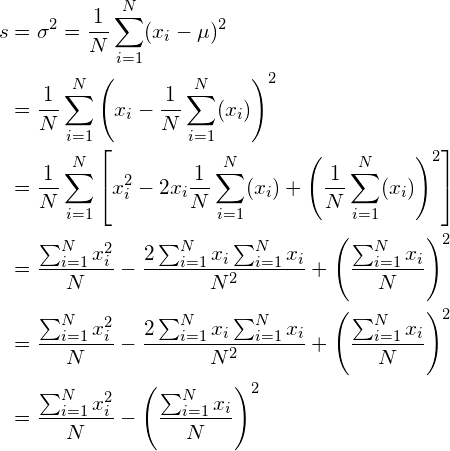 It’s not easy to find why you have to divide the sample variance by n-1, on many statistics books….! Hi Vincent, this is a really great article… Well written and nicely explained! 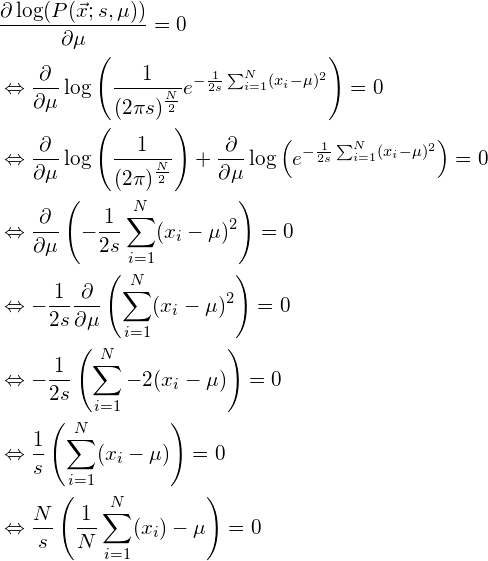 Just a small typo I found: In the section “Estimating the variance if the mean is unknown”, subsection “Parameter estimation” in the third equation there is missing an s in the denominator of the first log-summand. Not a big thing, since it is eliminated anyways but just wanted to let you know. can you please give a proof that the maximum likelihood method guarantees an unbiased estimator is also minimum variance? Nicely written article, but I think you are super confused about your “hat” notation. In Statistics, the hat is reserved to denote the estimator or the estimate (depending on the context), whereas without a hat is the population parameter. 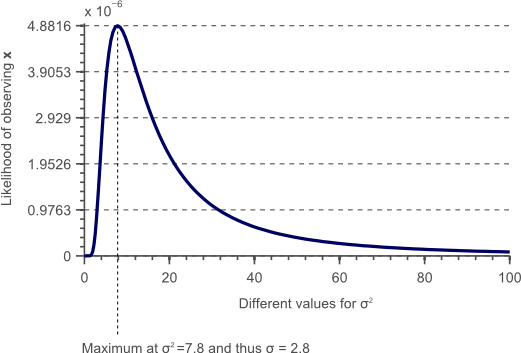 In your equation (4) mu and sigma are clearly the parameters of the normal distribution, however in the preceding paragraph you say these are estimators, namely the empirical average and empirical variance. Check “we can write their joint likelihood function as the sum of all individual likelihoods…” directly before equation 5. I think it should read “the product of individual likelihoods” instead of sum. Thank you for your articles, I have found them very helpful. Outstanding explanation of one of the “mysteries” of statistics that has long defied a good explanation. Thanks for taking the time to post. Hi, there, I like your essay very much. I hope you do not mind that I have translated your article to Chinese. I will remove my article immediately if you do not allow me to release the Chinese version of your article. Hi Michael, it’s an honor, great work! Thanks a lot!